Any stories you hear about these creatures stalking other animals and humans, about their size and their strength, are probably NOT exaggerated. Don't assume it's safe to swim if there is no sign! Crocodiles attack out of deep, still or muddy waters, where they can't be seen. Always stay well away from those. Small creeks, waterfalls, rock pools etc. are usually fine, but if you're not sure stay out of the water. Ask first! Either the locals or the next tourist information centre. Stay away from the water's edge. No matter if you are camping, fishing or taking an evening stroll: stay away from the water's edge. Fishermen, don't clean fish near the water, or discard fish scraps in the water. Be careful when launching boats. Avoid going in the water if at all possible. Don't dangle your arms or legs over the side of the boat. Don't feed Australian crocodiles. Also, don't harass or provoke them, don't interfere with them. Even the small ones, leave them alone! Don't leave food scraps at your camp site. Let me recount some incidents and the tragic fatal saltwater crocodile attacks of recent years to reinforce the above points. "The attack happened at 4am in the morning. He took one bite of the tent and then walked slowly backwards turning his head from left to right. The tent ripped opened and he took off with bedding from the tent. I flattened the car battery by hooking up a handheld spot light to the cigarette lighter and turning the ignition on full. The battery was flattened within minutes. We were stranded there for another two nights before we were rescued. My friend walked 12 kilometres and left a note on the Gibb River Road asking to be rescued." Always camp well away from the water's edge. Similarly a friend of mine had been camping at the lower Ord River near Kununurra. Thought he was doing the right thing by keeping all the fish scraps in a bucket. He woke up the next morning to find a crocodile had marched through the camp and helped itself to the scraps anyway. He too had camped far too close to the water. It is unusual for a crocodile to leave the water at all, and certainly to move far away from it. Stay well back and you will be safe. Don't feed crocodiles, and don't leave arms or legs dangling over the side of a boat. Update: November 2006 a Belgian tourist is bitten on the leg after wading into the water at Cape Tribulation, to attract a crocodile closer, so he can take a better picture. How stupid can you get??? Turns out, he's not the only one... Here's an article about another attack that occured when posing for photographs. Quoting the victim: "I began playing with it for a photo." Update: In 2008 a woman is attacked and suffers injuries to both thighs while wading in a creek crossing in Litchfield National Park. Now, there are designated swimming areas in the park, and then there are many river and creek crossings that you are told to stay out of! July 2010: After being kicked out of the tavern drunk, a man climbs over the fence in the Broome crocodile park and jumps onto the back of a five metre croc. Bitten badly on the legs he was lucky to escape alive. Yes, if you try hard enough you can get a crocodile to attack you even during the cool dry season! 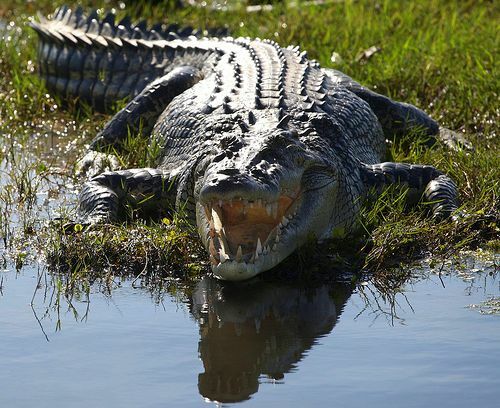 May 2011: a 59 year old fisherman is injured while fishing from his dinghy when a crocodile jumps and manages to grab him on the shoulder. 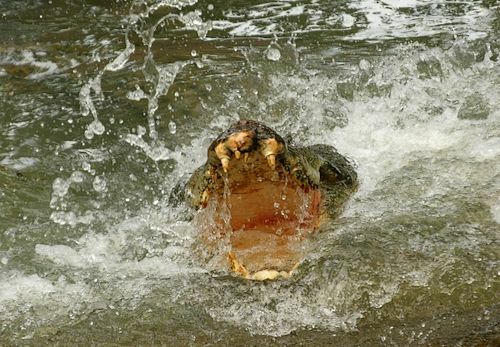 The 2.5 metre croc lets go after he rams his elbow in its throat. (Attacks by crocodiles that size are rarely fatal. A big one might have pulled him out of the boat.) According to a zoologist the crocodile might have associated fishermen with easy meals or free handouts. 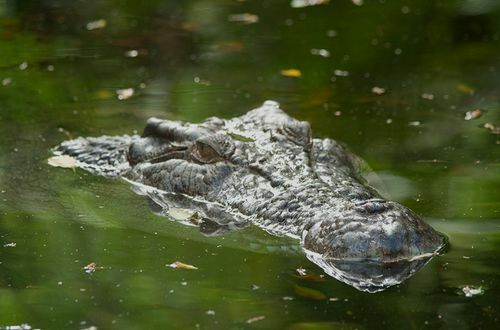 2012: In northern Western Australia the female employee of a cruise ship was attacked while taking a swim in a freshwater pool in an area known to be inhabited by saltwater crocodiles. She was grabbed by the legs as she was leaving the water. 2003: a 22 year old Northern Territory man is taken after wading too far into the Finniss River near Darwin. He and his friends knew very well about the risk of crocodile attacks. Stay away from the water's edge! 2005: 3 fatal crocodile attacks occurred in 2005. A man is grabbed by his arm and pulled from his canoe in northern Queensland. Apparently he had been strongly advised against canoeing... 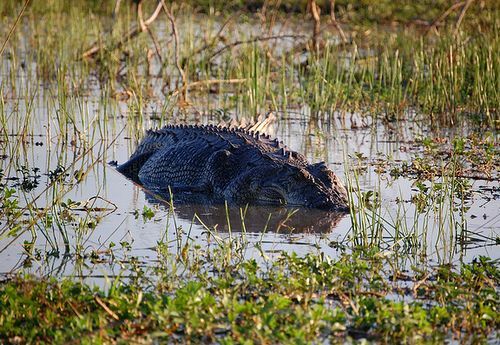 The other two crocodile attacks occurred within a week of each other, both in the ocean waters of the Northern Territory coast. In both cases the victims were diving/snorkelling. There have been another dozen or so crocodile attacks in the same period that didn't end fatally. In all cases the lucky survivors had either been in the water, or camping far too close to the water. 50m distance is the absolute minimum, the further the better! It also needs to be said that for an Australian saltwater crocodile to leave the water and walk into a human camp it has to be familiar with humans! You can help to prevent attacks from happening by not feeding crocodiles, and not discarding scraps and fish guts etc. into the water. The river has an estimated population of four to five saltwater crocodiles per kilometre. The girl had gone to the river's edge by herself, apparently to collect water. At night time!! Kids are much more likely to be victim of a crocodile attack because of their size, squatting down will make anyone look even smaller to a crocodile. A perfect target. The "experts" called this crocodile attack "incredibly bad luck", and several Australian crocodiles were killed until the "guilty" one was found. September 2008: A 62 year old man disappears from the banks of the Endeavor River (far northern Queensland). He'd been camping there and checking his crab pots. Left behind were the broken rope from the pot, a video camera on the ground and a big crocodile slide mark. Within the next two weeks three large crocodiles are caught in the area. One of them contains the remains of a human body. February 2009: After following his dog into the water, a five year old boy is taken by a large saltwater crocodile in the Daintree River (far north Queensland), in front of his brother. March 2009: An eleven year old girl is taken by a large saltwater crocodile while swimming at Black Jungle Billabong near Darwin, in front of her friends. (The Black Jungle Reserve is accessible strictly by permit only. This is not a public swimming area or in any way monitored.) Her remains are found later on the river bank. May 2011: On Elcho Island (515 km east of Darwin) a 54 year old fisherman disappears while fishing, in a spot where he went fishing every day. He is known to often wade out into the water. The man is believed to have been taken by a croc. December 2011: The body of a 49 year old barge captain is found in remote waters off the Cape York Peninsula. He was spearfishing and it looks like a saltwater crocodile was responsible for his death. 17 November 2012: 340 km east of Darwin a seven year old girl disappears while swimming in a billabong near an outstation (small Aboriginal community, about 100 km from Maningrida, near where the 2006 fatal attack happened). Witnesses say the crocodile first attacked a man and then grabbed the girl and pulled her under. As I am writing this police are still searching for the girl. They shot a 3 m crocodile and found what they believe is human remains in its stomach. All of the above crocodile attacks could have been avoided. Please, while travelling the north of Australia, act crocodile wise! Return to Australian Crocodiles or read more about Saltwater Crocodiles.